Bonnie Brown has always loved dogs. Whether it was her childhood Beagle Willie or her beloved Norwegian Elkhound Ingrid who was her training partner for 15 years. It was through Ingrid that Bonnie learned to be a dog trainer in her mid-50’s. 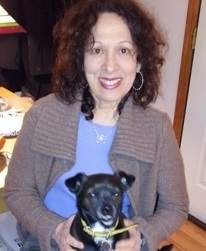 After obtaining a Professional Dog Trainer’s Certification from The Center for Animal Behavior & Canine Training, Bonnie furthered her dog training education by attending many workshops in the tri-state area. While she learned of various techniques and theories about dog behavior, some of the specific practical information that she needed to successfully work with her clients and their dogs on a day-to-day basis was missing. In 2003 Bonnie started Dog Trainers Connection to fill this void by presenting workshops featuring well-versed dog trainers who had invaluable, advice on how to become a better dog trainer. However, at the time they weren’t given that many opportunities to share this knowledge. Now through DTC, Bonnie continues to showcase creative and innovative pet professionals who bring the best information available on dog training to both those in the business and to the pet owning public. Bonnie lives in New Jersey with her husband Joel, her silent partner in DTC, and their 6 year old adopted Chihuahua-Pug mix, Bianca. WE OFFER REAL WORLD HELP FOR REAL LIFE SITUATIONS WITH OWNERS AND THEIR DOGS. If you are open minded and aren’t afraid to question what you read and hear. If you want to learn and get expert dog training advice from dog training professionals, then DTC is the place for you. We share with you what professional dog trainers learn from working in the trenches with people and their dogs every day. DTC doesn’t claim to have all the answers to dog training and behavior problems but we promote safe, proven and creative dog training information for dog trainers who want to give their clients their best and to dog owners and dog lovers who want the best for their dogs!